The Roundabout’s latest revival of the 1968 play that brought Arthur Miller back to Broadway after12 years for a decent run of 429 performances is a classy affair, but in spite of a first-rate cast and production team, I found it less gripping than past productions, even in the practiced hands of director Terry Kinney. There was a fine 2004 revival in London with the late Warren Mitchell and a Broadway revival in 1999 with Jeffrey DeMunn and Bob Dishy, both excellent productions that seemed to belie any notion of the play being second-rate Miller. I have less vivid memories of a 1992 Roundabout mounting except a general recollection that it was good. And there was also an estimable TV version with George C. Scott and Colleen Dewhurst. 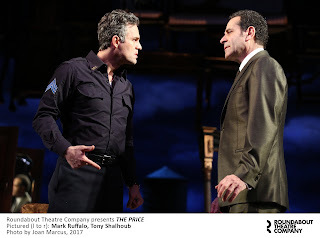 “The Price” tells the story of two llong-estranged brothers: Victor (Mark Ruffalo), a hard-working policeman (Mark Ruffalo) struggling to make ends meet, and Walter (Tony Shalhoub) who has become a successful surgeon. They meet as their father’s furniture is to be sold off. Victor has been negotiating with Solomon (Danny DeVito in his Broadway debut), an 89-year-old appraiser. The deal has, in fact, been sealed when Walter makes a surprise appearance, appearing to want to make amends with his brother, while attempting to negotiate for a better price at the same time. He also suggests to the more principled Victor a somewhat shady tax write-off solution. Victor’s wife Esther (excellent Jessica Hecht) can’t understand her husband’s reluctance to bury the hatchet with Walter and move on, and bargain for a better deal, too. Eventually, the cause of the estrangement comes to light, in a heated second act climax rooted in revelations about Victor’s having eschewed career advancement in light of selfless caring for their aging father But all these characters are, in some way, at odds with one another, and “the price” of the furniture metaphorically mirrors the price they have all paid after a lifetime of untruths. 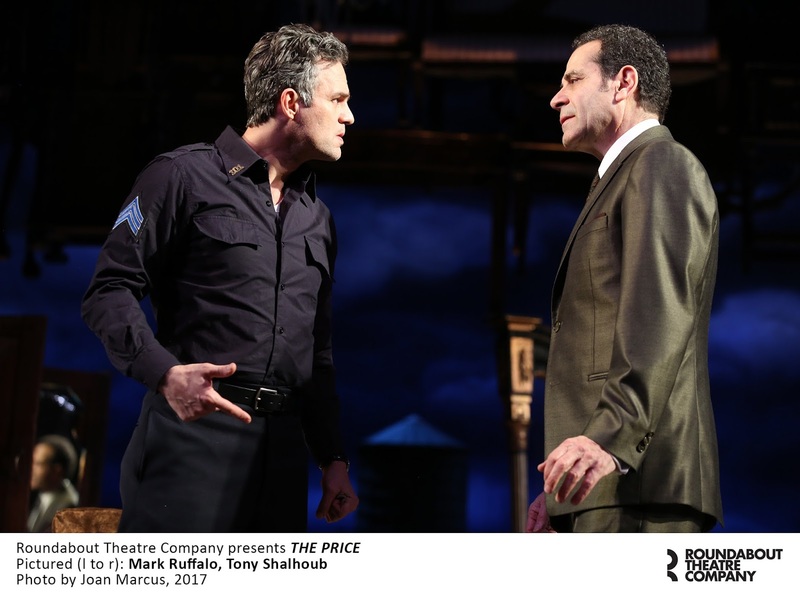 Walter’s entrance enlivens the second act, and Shalhoub certainly plays him dynamically. 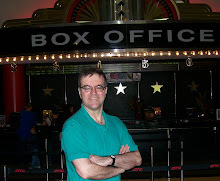 And yet, strangely, I felt the play never quite caught fire, unless it just happened to be an off-night. Victor’s passivity in the first act (though well played by Ruffalo) and Solomon’s irritating salesman tactics (amusing though DeVito is, including some outrageously funny business with a hard-boiled egg) make for a sluggish first act. Overall, on this occasion, the play’s imperfections seemed less smoothed over than before. Production elements are above reproach. Miller’s theme of materialism is mirrored in Derek McLane’s atmospheric set, an overstuffed Manhattan apartment, with furniture even hanging from the ceiling, all atmospherically lit by David Weiner. And the principals are all well outfitted in Sarah J. Holden’s costumes.